Given the fact that are the largest moving part of your home, a good finish of garage doors makes your home more attractive. You will enjoy in various other advantages of this type of door, such asquiet opening and closing, possibility to park right in front of the door, possibility of opening from car or house... In addition to good design these doors are made to last for years. At the same time are light and rigid. 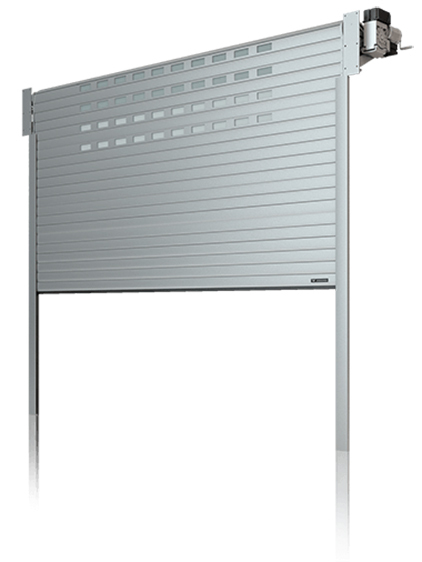 Insulated aluminum roller garage doorsvare made of slats width of 55 or 77mm. Depth of profiled aluminum is 1 mm, and depth of slats 23 mm. Polyurethane filling between the panels provides good insulation. Roller garage doors are mounted on aluminum guides with built in sealin grubber. Last slat on the bottom side has a sealing rubber placed along the whole length to improve sealing and prevent dust from entering. Roller doors are manufactured in white and grey variants according to the production standard, but there is a possibility of coloring according to the buyer’s desire. High quality workmanship, quality materials, resistant to snow, rain and cold. Of long standing, confirmed by warranty. They are build in with silent electric motor. The electric motor meets all modern standards, quality and durability. It has automatic locking, limit switches, remote control - all for maximum comfort and safety of use. Roller doors have security system which activates facing any obstacle and the door automatically stops and opens. These doors have a system that prevents violent opening in case of break-ins. In case of power failure these doors have an opening system with movable spindle - crank. Ceiling sectional doors are an ideal solution for garage, industrial, or any other door where you have limited space. With the help of guides mounted on sides of inner walls of the garage, slide under the ceiling, leaving the entire opening and the area around the opening free. 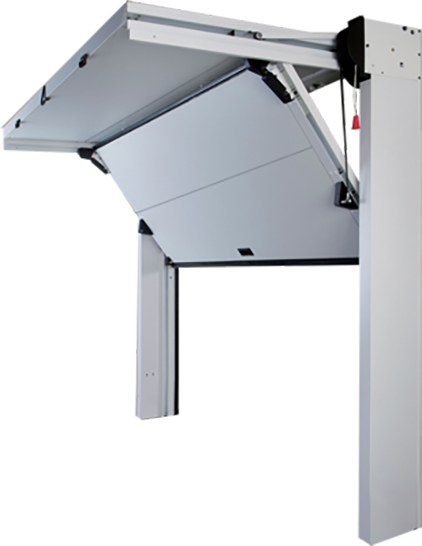 The doors are balanced with torsion springs, which makes them easy for manual lifting. The doors are made of sections (panels). Connecting is done with special fittings that provide excellent hydro and thermal insulation. The production quality of the sections and joints guarantees a good functionality of the entire structure. The sections are made of galvanized steel tin, which is plasticized, made with relief ornaments, or flat surface. Filled with polyurethane, thickness of 42 mm, so as to provide excellent thermal and sound insulation. Finishing provides protection from external influences, while materials used for in production give massiveness and durability. In case of any damage sectional structure allows easy replacement and repair. Standard colors are white and gray, with the possibility of painting in any color in RAL chart.